New York Fashion Week has made me realize how very far away I am from high fashion. The runway shows, the glamour, the paparazzi-- all of the beautifully ridiculous celebrations and catastrophes feel unreal. Living in Milwaukee certainly isn't the worst place when it comes to fashion. There are little glimmers of creativity and style hidden in the city in the shape of thrift stores, boutiques, and even fashion co-op's. I'm not completely without access to stylish clothing. The local malls host stores like Forever 21 and H&M, both of which contain high fashion inspired clothing at extremely reasonable prices. Sure, the quality is sacrificed, but each customer gets what he or she pays for. But getting back to my original point, living in Milwaukee has helped me appreciate the little things. The pockets of vogue I can own without risking an overdraft fee from my shriveled bank account. Chanel's Jade Polish-- going for $200 on Ebay. 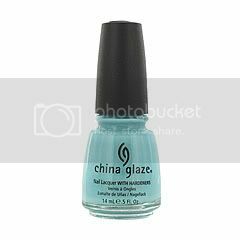 My compromise-- China Glaze's 'For Audrey' for $3.99. Granted it's a little more robin's egg blue, but it still looks fresh and resonates with the same pastel spring essence as the Chanel version. Since I've been frequenting many of the thrift stores and consignment shops in Milwaukee, I plan to write reviews, guides, and recommendations. My shopping addiction has got to prove to be useful sometime, right?